While large-scale farming was the major goal of the Northern Pacific Railroad and its successors, small scale-farming was in full swing. Immigrants and settlers from other parts of the Eastern United States moved westward to claim land along the Northern Pacific way. Many of the smaller farmers who came to the Red River Valley claimed land and built sod homes. Resources in the Red River Valley were sparse on the open frontier and sod was one of the only readily-available building resources for people, mostly immigrants, with limited income. Because the first settlers claimed the limited land by the river, the flood of settlers that came later were reliant on the prairie and used sod as their primary building material. Sod houses were built by plowing up segments of prairie held together by the system of roots from the prairie. The roots of grasses and other plants would hold the sod strips together. Through stacking and molding these strips, walls were built up to create a one roomed home. The walls of an average sod home would have been about five feet to seven feet tall. 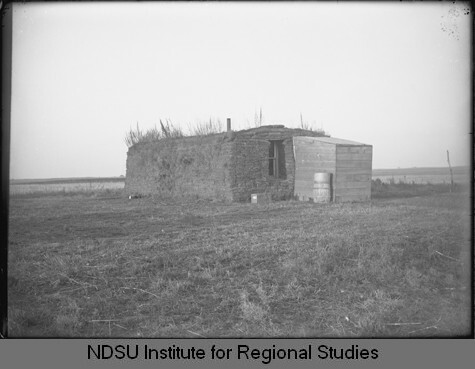 “The first block of sod was laid grass side down…Subsequent blocks were also laid grass side down and the grass acted as a sealant…to seal sod to sod.” Generally, when people were building sod houses they would stick together beams and rails with mud, grass, bison hair, etc., and lay it across the roof before covering it in sod. Many family members could live in one sod home that averaged 12×20 feet in size. In order to expand a sod home after it has been built, lean-tos were often added as extra rooms. Railroad expansion in this era also meant that more materials arrived daily for settlers in the area. Sod homes were a stable enough structure for families to survive and it was a form of building that was familiar to immigrants and other settlers alike. People began to abandon sod homes, however, for structures such as a claim shanties or tar paper shacks. Bachelor, Rosemary. E. “Sod Houses of Pioneers on the Prairie” Suite 101, American History, 2009. Midwest Historical and Genealogical Register, North Dakota Institute for Regional Studies (NDIRS), Vol. 24, No. 2, 1989.